This series has looked at Resources for knowing more about the old one and two room schools; the Buildings themselves; and the Curriculum. Now the school bell's ringing and it's time to enter the school for A Typical Day. Even before the students arrived, the teacher arrived early to heat the building and maybe plan the day. Heat near the stove was too much, but further away would be cold and drafty. (Is it any wonder those improvements recommended later for school buildings put the furnace in the basement to warm the entire room?) The teacher's desk might be raised to both avoid drafts and oversee the class of students from 5 years into their teens. Later in the day, the stove might also thaw out the students' lunches brought in a covered bucket called a lunchpail. Ink might freeze in the inkwells, but setting them on a stove wasn't a good idea as it could explode splattering everywhere. School families were expected to provide the wood or coal. Some schools separated the boys and girls right away at the door and cloakroom areas. The cloakroom held coats, toys and other belongings, frequently including lunch pails. Seating varied from individual or shared wood and iron desks to benches. Seating put the youngest students to the front, with the older children at the back and also separated boys and girls. Recitation took place at the front. The term "Go to the head of the class" meant the highest honor to be standing at the head of the class at the day's end as students were sent to the back of the room when they made a mistake. Blackboards might simply be boards painted black or actual slate. Pull-down wall maps for Geography and possibly a globe, supplemented by a portrait of George Washington and possibly Abraham Lincoln plus a flag indoors for the daily Pledge of Allegiance. 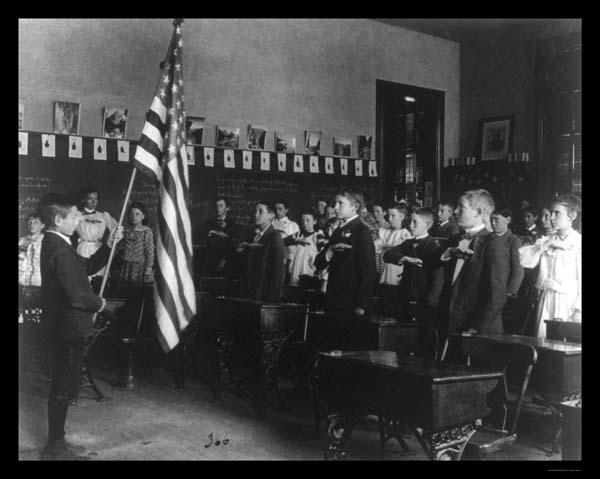 Days typically started with the class reciting the Pledge of Allegiance after it was created in 1892. The Pledge was revised four times up through 1954 when "under God" was added. It also was quite common then to follow the Pledge with a Bible reading and a hymn or patriotic song, then began the various reading groups and other classes. Students were expected to help one another and often they shared books and even desks. The previous post on Curriculum mentioned what classes were taught for this wide age and grade span. Testing might be done with recitation or quizzes using the spelling bee style to keep it interesting. Teaching specific facts in Geography like the states, their main products, and capital cities or in History such basics as the presidents and the Revolution made recitation and contests easily judged. To bring the week to an interesting close, after the last recess the remaining time on Fridays might be spent in spelling bees, and geography or arithmetic contests. Reward of Merit awards might be given exemplary students for industry, punctuality, and good conduct. The teacher might include a bit of singing, even in parts, as it worked well for the annual Christmas program. Art was also a possibility. It wouldn't be until the 1920s and 30s that the privies or outhouses would be replaced. The other sanitary provision was a basin and dipper of water that usually came from a nearby pump. While that and the cast iron stove was usually the teacher's responsibility, boys could be expected to pump the water. Equipment inside and even outside the building might vary as the community raised money to support their school. The flagpole outside was an easier guaranteed item. 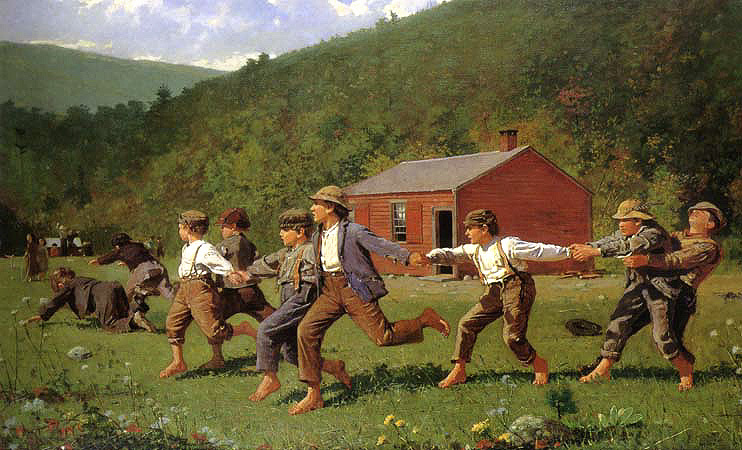 During recess there were a variety of games: Alley Over the Roof, where a ball actually would be tossed over the school between 2 teams; Red Rover; Blind Man's Buff; Crack the Whip (on the grass as well as ice); Drop the Handkerchief; and a homemade form of baseball called One-Eyed Cat where a stone wrapped with yarn from a worn-out sock made a ball and a branch or sapling was shaped into a bat. Hoops and other toys such as dolls would also be brought from home. Schools were community social centers, providing town meeting halls, sometimes church facilities on Sunday, and such entertainment as the annual spelling bee sending a contestant on to compete county-wide, the Christmas program, monthly fundraising box socials, and the school picnic. Older girls would decorate a box like a shoebox from Sears and Roebuck, letting the boys they wanted to bid on it know which was theirs. After the auction, the top bidder ate with the girl who made the box. Inside might be hard-boiled eggs, pickles, such desserts as cookies, cake or pie, and other food items that were special and also could safely sit in the box for a while. At first families paid for their children to attend as it wasn't covered by taxes until much later. The families involved also chose their own school boards to hire and supervise the school. When school began to be legally enforced, counties hired Truant Officers to prevent children "playing hooky" or families keeping their children out. Sometimes a parent would refuse to send their children until the County Prosecutor had the parent spend a few days in jail. The Truant Officer might also be the Probation Officer for incorrigible boys sent to Reform School. For more on schools of the past, the next post will end this series with a look at the School Teacher. The previous three posts were on the various Resources about the schools of the past, the Buildings, and the Curriculum.